Search results for "Solomon Cordwell Buenz"
By the time currently planned extensions to Los Angeles’s Purple Line are completed in 2024, the subway line will run from Downtown L.A. to Westwood, roughly nine miles further than it does today. Work on the extension is well underway, and, not by coincidence, the first crop of Purple Line–adjacent luxury high-rise housing projects recently came online, providing a glimpse at what L.A.’s residents can look forward to as transit starts to rework surrounding neighborhoods. As speculative developments, the new crop of towers represents a sort of trial run for transit-oriented luxury housing in L.A. The new buildings are not innovative so much as they are novel, imported typologies for a city in which the wealthiest denizens typically occupy mountainside perches, not the tops of towers. These first projects share a few qualities—namely that several came into being as the worst of the Great Recession hit, products of not only hard work but also a litany of delays, project sales, and redesigns. Their final manifestations, hard-fought as they were, hint at some of the shortcomings the recession generated: generic podium-and-tower massing, use of conventional materials like smooth stucco and glass, and generous, if not overly fussy, shared amenity spaces. Downtown, two projects—the TEN50 apartments by HansonLA and Atelier DTLA by San Francisco–based Solomon Cordwell Buenz (SCB)—will bring a combined 514 units to a dense neighborhood already connected to the existing transit network. The TEN50 condominium complex, which features an architecturally dynamic form despite its conventional construction systems and materials, was first approved over a decade ago, but did not enter construction until 2015. The 151-unit complex rises 24 stories and features 5,900 square feet of groundfloor retail. The tower is wrapped in expansive window assemblies and features projecting balconies. At one corner, planar massing shifts as multistory, undulating curtainwall-clad volumes jog in and out of the main building mass, creating a series of overhanging terraces. The building’s most striking amenity? A drone landing pad on the sixth floor designed in anticipation of robot-based on-demand delivery services. Two blocks closer to the subway line, SCB’s 33-story Atelier DTLA apartment building features 363 luxury rental units in a black glass-clad tower. The structure features an expansive fifth floor amenity level complete with swimming pool, planted terraces, bocce court, and a shared lounge carved out from the main building mass. The tower’s rooftop terrace has wraparound views and a second swimming pool. The apartments themselves feature generous interior designs by Rodrigo Vargas Design, with bedrooms and living areas oriented around the tower’s slightly canted and sometimes cantilevered exterior walls. In Koreatown, the Purple Line’s current terminus, Steinberg Architect’s 190-unit 3033 Wilshire bolsters the “linear downtown” running along Wilshire Boulevard. The tower’s floor-to-ceiling curtain-wall facades are interrupted by vertical spandrels; along the tower’s most prominent corner, the walls gently angle inwardly, creating long, tapered balconies. The larger units are designed with bedrooms spaced far enough apart to accommodate shared living arrangements, according to the architects. A podium-level dog run is fronted by a series of private terraces adjacent to the space, while operable awning windows and inset balconies rhythmically interrupt the tower’s stucco-clad facade along this exposure. 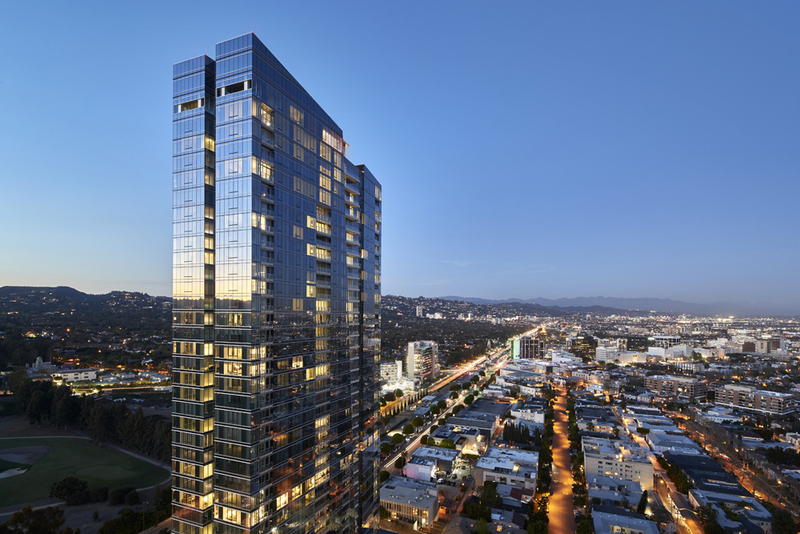 The 40-story Ten Thousand Santa Monica tower by Handel Architects is decidedly the most high-end of the bunch. The 283-unit tower was completed in 2016 and features canted exterior facades and a broken envelope that provides each of the six to eight units per floor focused views and variable outdoor patio spaces. The units feature interior design by Shamir Shah Design and include 10-foot-tall ceilings throughout, as well as fancy finishes like Italian titanium travertine, statuary marble, limestone, and walnut flooring. The higher-end units feature 16-foot-tall living areas. The complex also boasts water-wise landscaping by Meléndrez, including a two-acre private park that faces south and is lined with 12-foot-tall privacy hedges. As these projects fill up with new tenants, eyes across the region will be turned toward how the completed towers interact with their surroundings and whether they facilitate pedestrian-oriented lifestyles. A big question moving forward will be whether developers and city agencies can forego their penchant for oversized parking podiums and whether, when faced with fewer budgetary and entitlement restrictions, architects and developers will begin to truly work toward a locally derived variant of the luxury tower typology. 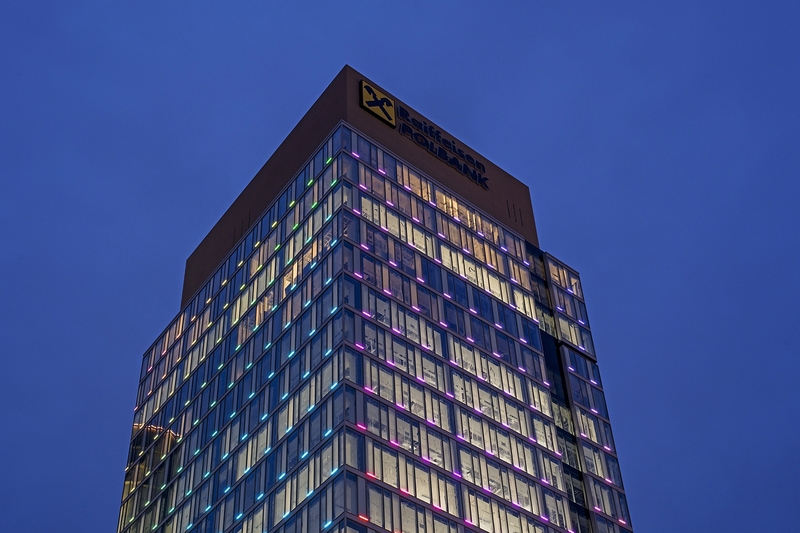 An active light display animates the facade of a new office building in Warsaw, Poland, highlighting the Wola neighborhood’s transition from industrial manufacturing to a new residential and office district. The Prime Corporate Center was designed by Chicago-based architectural firm Solomon Cordwell Buenz in conjunction with the Warsaw office of Epstein. Sears and Roebuck Company may no longer be the giant it once was, yet its physical presence is still all over the city of Chicago. As the company had no brick and mortar retail stores until nearly 30 years after its founding in 1886 as a mail-order catalog, many of its earliest buildings were for logistics and storage. One of those old structures is its large original headquarters and catalog printing facility. Abandoned for 40 years, the epic building has now been converted into 181 affordable housing units. Located in the North Lawndale neighborhood on the city’s West Side, the complete renovation was lead by Solomon Cordwell Buenz Architects, James McHugh Construction Co., and Denco, for client Mercy Housing Lakefront. The six-story brick complex will house upwards of 300 residents in 79 one-bedroom units, 52 two-bedroom units, 40 three-bedroom units, and 10 four-bedroom units. Other amenities include a community room, laundry facilities, a computer center, and an exercise facility. The redeveloped complex will now be known as the Lofts on Arthington. Limestone and terracotta details throughout, as well as many of the other original details, were restored in the process of converting the campus. Nearly the entire roof and over 100,000 square feet of flooring had to be completely replaced. Much of the structure had to be updated as well, along with filling in underground tunnels once used by Sears to move across the complex. In recent years, Sears has continued its decline, with an announcement from the company’s leadership expressing “substantial doubt” about its future. Famously, the company’s namesake supertall tower was renamed the Willis Tower in 2014, though most Chicagoans still refer to it as the Sears Tower. The Old Chicago Main Post Office, which was once the largest post office in the world thanks to Sears’s mail-order business, was vacated in 1997. Now with many of Sears’s old buildings being refurbished, and the Old Main Post Office being completely renovated, some of Chicago’s largest structures, from the golden age of mail-order merchandising, are getting a second chance at life. Chicago’s Wrigley Field is more than a baseball stadium. It is a pilgrimage site for faithful Cubs fans and for anyone else serious about Major League Baseball. The second oldest Major League stadium, Wrigley has changed very little in its 102 years. On the other hand, the surrounding Lakeview neighborhood has evolved, and is evolving, at an ever increasing rate. Three new major projects immediately adjacent to the field are hoping to transform the area into a year-round attraction. Sharing an irregular block with the stadium a new mid-rise tower is well on its way to completion. 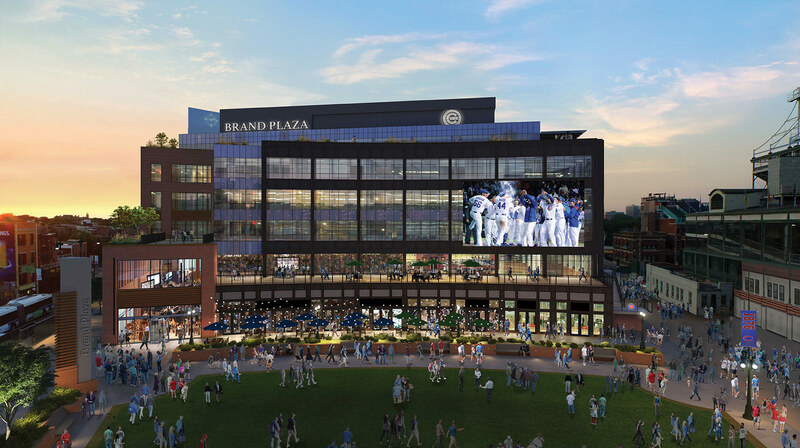 Designed by Stantec (formerly VOA), the mixed-use office-retail project will be the new home of the Cubs administration and a backdrop for a new plaza. The six-story structure is careful not to be taller than the stadium, and is only slightly taller than the three- and four-story residential neighborhood beyond. The triangular plaza created by the new building and the stadium is expected to be a vibrant public space with programing throughout the year. Along with the office project, Stantec and Hickory Street Capital are also behind a seven-story hotel beginning to rise across the street. The future Starwood Hotel will have 180 rooms, with extensive retail and concessions at street level. Both projects were initiated and backed by the Ricketts family, owners of the Cubs. The office tower and plaza are expected to be completed by summer 2017, and the hotel opening is planned for summer 2018. Directly across the street to the south of the stadium, another major development has recently broken ground. The Solomon Cordwell Buenz-designed Clark and Addison is going up after nearly 10 years of negotiating with the public over the project’s form and program. Weaving between existing buildings along Clark street, the large mixed-use complex will include a 10-screen theater, retail, apartments, and a recreation clubhouse. Residents of the 148 apartments will have access to a community kitchen, a fitness center, event space, and a business center. The building’s clubhouse will also offer over 5,000 square feet of indoor space and 8,746 square feet of rooftop outdoor space, which includes a pool and spa. The project steps back six feet at the street level to widen the sidewalk for the throngs of fans that pass the project on their way to the stadium. By 2018, the heart of the Wrigleyville neighborhood will be unrecognizable, except for the constant that is Wrigley Field. Considering the proximity to Lake Michigan, transportation, a major university, and an already thriving nightlife scene, it was only a matter of time before the area around the field was updated. With a new public plaza, and more non-baseball related entertainment, the Friendly Confines will be just that much more friendly. Slowly but surely, one of Chicago’s slightly offbeat landmarks is being covered up. The Homage to the Chicago School of Architecture, an epic multi-faced mural by Richard Haas, is disappearing behind a new tower development in Chicago’s Old Town. The mural adorns a 1929 apartment building, formerly named the LaSalle Towers Hotel. The building was remodeled in the 1980s by Weese Seegers Hickey Weese, who advocated for the mural. The buildings north, south, and western faces were left nearly blank when it was originally built. Some speculate that it was expected that other tall buildings would quickly rise up around it, leaving no need to give the faces an aesthetic finish. It has taken 70 years but that prediction is finally coming true at the cost of an unexpected icon. The mural is dedicated to the Chicago School of architecture and depicts many of the signatures of late 19th century Chicago. Each face employs a trompe-l'œil technique often used by Haas. The east face of the building depicts rows of Burnham style bay windows and Chicago-style bases and cornices. The north face shows a faux reflection of Adolph Loos’s submission to the Tribune tower competition, a Doric column shaped tower. The south face recreates Louis Sullivan’s golden arch from the 1893 World’s Columbian Exposition Transportation Building and the circular window form Sullivan’s Grinnell, Iowa, Merchants' National Bank. The busts of Louis Sullivan, Danial Burnham, John Wellborn Root, and Frank Lloyd Wright are painted near the base, below the arch. 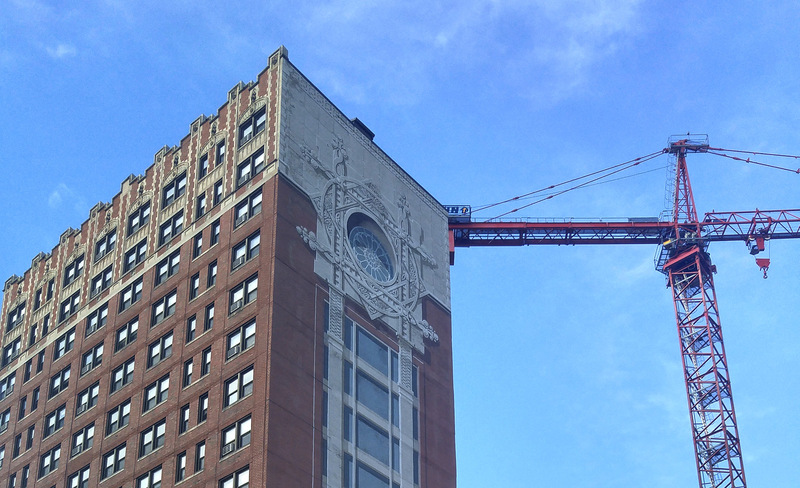 The new residential tower rising around the mural, The Sinclair, was designed by Chicago-based Solomon Cordwell Buenz. The 420-foot-tall Sinclair will be 35 stories with 390 units. Thirty-nine of the units will be reserved for affordable housing. The base will include 55,000 square feet retail space. This includes a grocery store (which once stood on the site), with a green roof. Though it was only a matter of time before the surface lots surrounding the Haas mural would be built up, the drive down LaSalle Blvd. won’t be the same without the defining art piece. The north face of the building will remain uncovered, leaving Loos’s tower visible to southbound traffic. A construction site cam shows the new tower rising and the mural disappearing behind. With at least four new towers, all within a few blocks of one another, either completed or planned to be completed before 2020, Milwaukee’s skyline is seeing its greatest change in recent memory. Though the city’s East Side and Third Ward, immediately north and south of downtown, respectively, have seen modest development over the past 15 years, the downtown itself has been decidedly quiet for more than 20 years. The first project to be finished was 833 East Michigan Avenue. 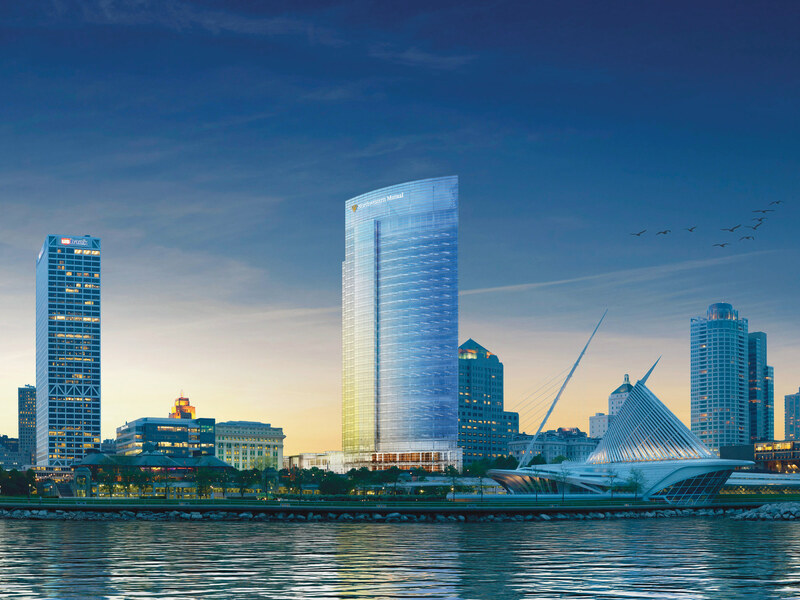 At 18 stories, the $100 million tower is tall by Milwaukee standards. The multitenant office building was designed by Milwaukee-based Kahler Slater. With so few contemporary office buildings downtown, 833 East stands out with its integrated technology and open floor plans. And with views of Lake Michigan on three sides, the project is particularly appealing as the city continues to improve the lakefront. Less than a block away, one of Milwaukee’s most recognized businesses, Northwestern Mutual, is doubling down on its investment here. The company’s 32-story, 1.1-million-square-foot office tower will be one of the cities largest and tallest buildings. The $450 million project includes the tower and a lowrise, with a two-block-long commons, which will connect the highrise to Northwestern Mutual’s other historic Benjamin H. Marshall–designed neoclassical office building. Designed by New Haven–based Pickard Chilton, the tower is a sweeping curve not dissimilar to Chicago’s 333 Wacker. Well underway, the project has already significantly changed downtown´s appearance. Much to the delight of the city, the tower will help maintain 1,100 jobs in the neighborhood, while potentially adding another 1,900. The commons will feature public spaces, including the new Northwestern Mutual Gardens, a visitors’ center, and a public cafe. Adding to the housing stock of the area, another skyscraper has just taken a major step toward becoming realized. The much-anticipated Couture, designed by Milwaukee-based Rinka|Chung, has recently received approval from the federal government for the demolition of the transit center that is currently on its site. Federal approval was required because the transit center was partially paid for with federal money. Local company Barrett Visionary Development is currently in the process of acquiring the land, and is expecting to start site work, including demolition, by August, with construction starting in earnest in early 2017. With completion of the $122 million project expected to wrap up in 2019, the Couture will rise 44 stories and include a public-transit concourse for Milwaukee’s forthcoming streetcar. The base of the tower will include 50,000 square feet of retail. Its position directly on Lincoln Memorial Boulevard means residents will have uninterrupted views of Lake Michigan, the Discovery World museum, the Santiago Calatrava–designed Milwaukee Art Museum, and the Eero Saarinen–designed War Memorial. Rinka|Chung also has its hands in the planned Lakefront Gateway Project, which will help connect all of these developments to the lakefront. Led by Milwaukee-based GRAEF, a team comprising of Rinka|Chung, Vancouver-based PFS Studio, Toronto-based Dan Euser Waterarchitecture, and social event group NEWaukee, the Lakefront Gateway will bridge the busy Lincoln Memorial Boulevard. Its design, titled Urban Confluence, won out in a competition against teams lead by AECOM, James Corner Field Operations, and the Office of James Burnett. The GRAEF design is intended to be a civic space and city icon, as well as a connection between downtown and the lakefront. For those familiar with Milwaukee’s downtown, all of this development may come as a bit of a surprise, considering the extensive number of empty stores farther to the west of these new towers. But Mayor Tom Barrett believes investing in downtown is vital to the health of the city as a whole. “This is a once-in-a-generation chance to make an investment of this scale in downtown Milwaukee. It means more jobs, a stronger tax base, more community support, and more Northwestern Mutual employees giving back to all areas of the community,” he said. 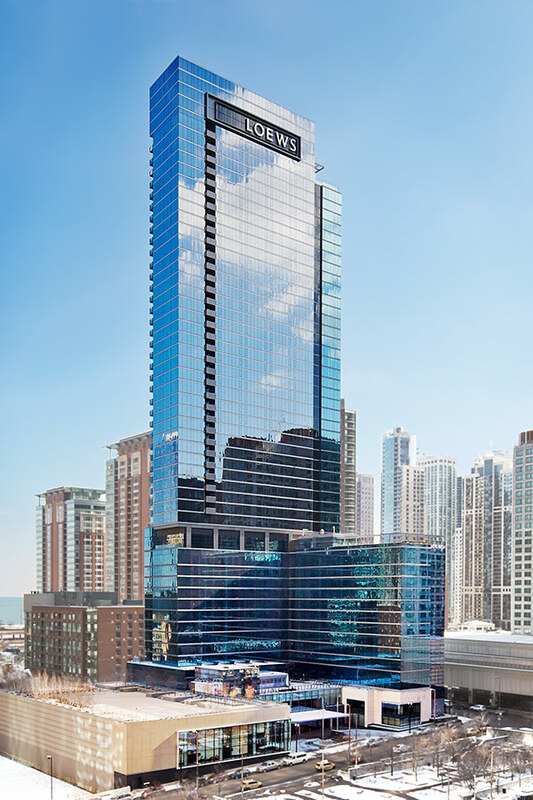 Chicago’s ongoing hotel boom has its latest icon: a 50-story glass tower whose owners proudly announced their new downtown presence with tall, white lettering visible from many blocks down the Chicago River. 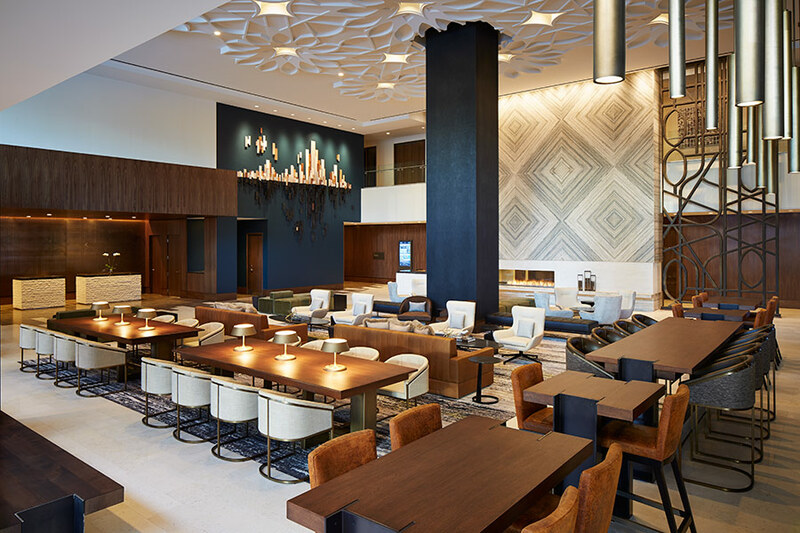 The opening of Loews Chicago Hotel follows the company’s July acquisition of the InterContinental Chicago O’Hare Hotel. At 928,000 square feet, the Streeterville location is a bold real estate move, but its architecture seeks to blend in tastefully. A stone and precast concrete base gives way to a tower sheathed in a blue-gray glass curtain wall. Chicago’s Solomon Cordwell Buenz designed the tower, recalling at times their work on The Legacy—a similarly understated glass tower whose shape maximized spectacular downtown views. 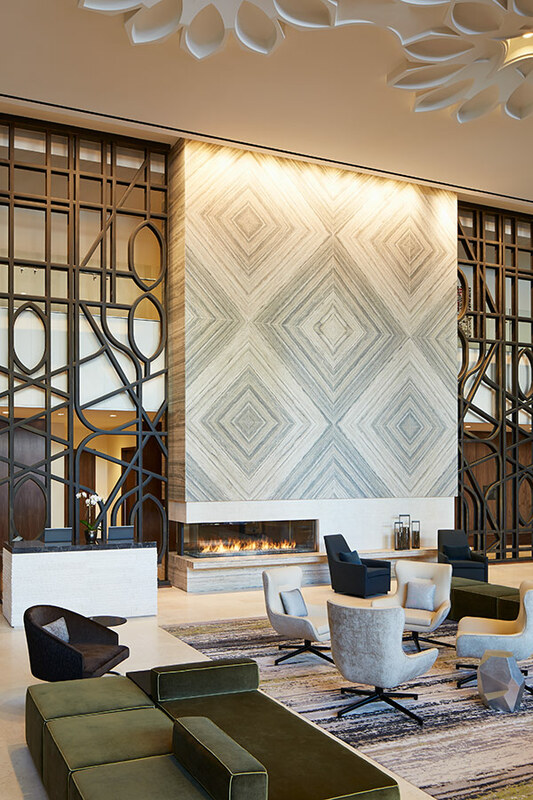 The hotel’s interior design “pays homage to Chicago’s strong architecture and the beauty of the city’s infrastructure,” according to a press release from Loews. Apparently an executive was inspired by Carl Sandburg’s famous poem “Chicago.” Its mutable, modern elegance could hardly pass for “Stormy, husky, brawling,” but touches of brick, concrete, and metal play nicely off more luxurious materials, like mohair, cashmere, and leather—a palette that was drawn from fashions “commonly worn in winter by Chicagoans,” according to interior design firm Simeone Deary Design Group. Work is currently underway on a new mixed-use development at Ohio's Oberlin College that, once complete later this year, will include one of only a handful of hotels pursuing LEED Platinum certification in the United States. The hotel operator is Olympia Companies, based in Portland, Maine. 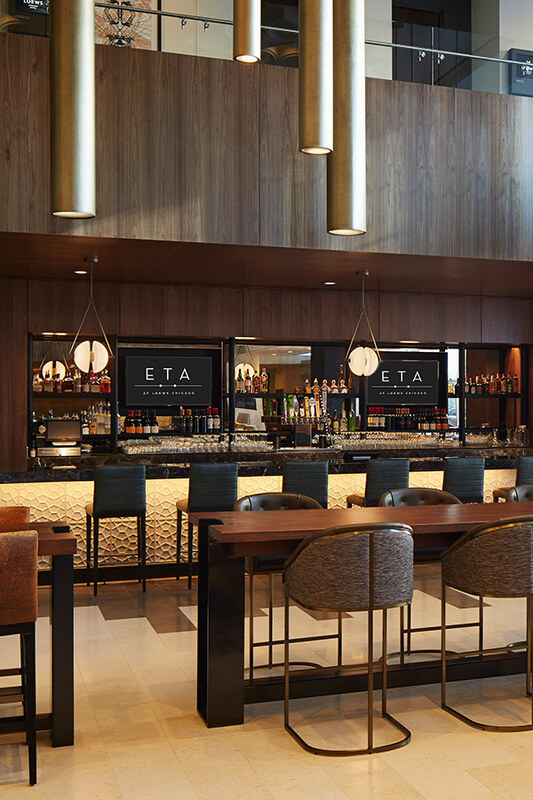 In addition to 70 guest rooms, the building features a restaurant focused on local food, 10,000 square feet of retail, a conference center, and a basement jazz club. Rounding out the facility's 105,000 square feet will be offices for the college's admissions and development staff. The Peter B. Lewis Gateway Center, developed by Cleveland's Smart Hotels, was planned to be “the cornerstone of Oberlin's Green Arts District,” at the intersection of North Main Street and East College Street. Chicago architects Solomon Cordwell Buenz designed the project, which will draw on Oberlin's existing 13-acre solar photovoltaic farm adjacent to campus. Smart Hotels' Christopher Noble said the design team worked with the New York office of Germany's Transsolar on the development of that solar farm, and the new building will not throw Oberlin off its target of purchasing 100 percent renewable energy for electricity by the end of 2015. 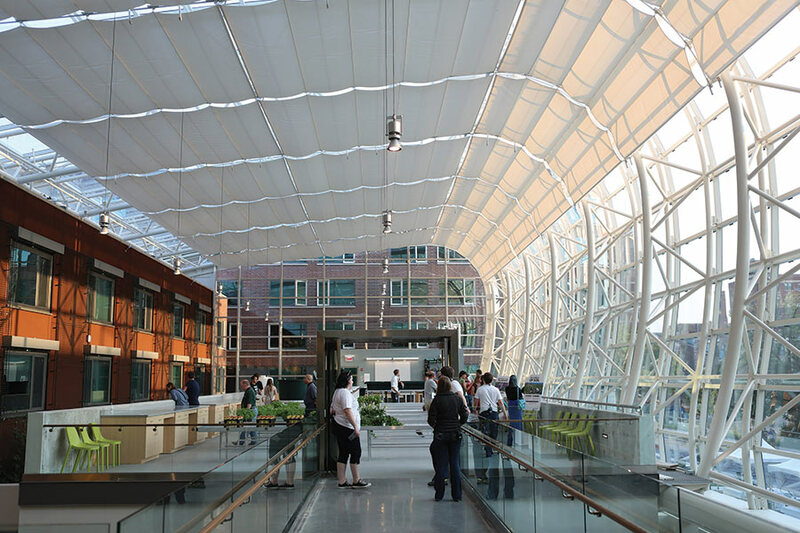 Mechanical engineers KJWW helped finesse the building's fully radiant heating and cooling, which employs no forced-air ventilation—although some back-of-house areas will still use some water-source heat pumps, Noble said. “We're relying on nonconventional HVAC systems,” said Noble, who added that heating and cooling needs will be fulfilled fully from geothermal wells on site. 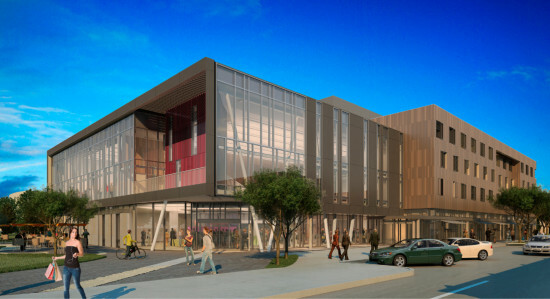 The building is expected to be certified LEED Platinum after opening early next year. 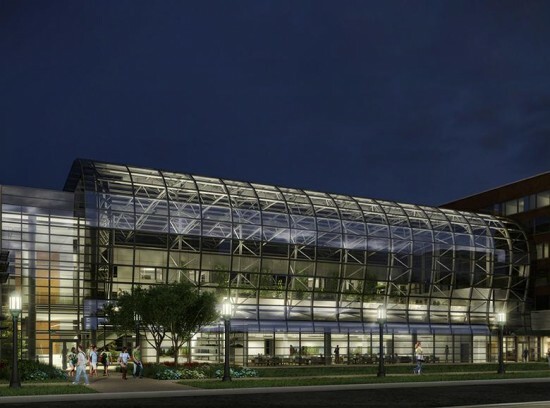 While the design team hasn't assessed the payback period for the building's sustainable features, Noble said Oberlin made energy efficiency a project priority. “It wasn't a cost issue,” he said. “It was a design issue—we were going to make a statement and do this.” Of the $35 million total project cost, $12 million came from outside donors, including $5 million from the building's namesake, the late philanthropist and chairman of Progressive Insurance Company, Peter B. Lewis. Chicago’s top art school announced big changes in its design department this morning. 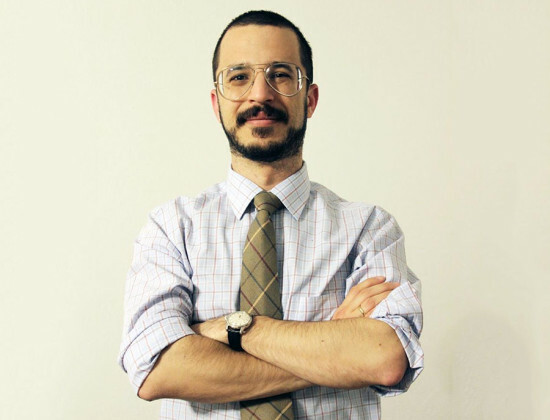 The School of the Art Institute of Chicago Thursday announced their selection of Jonathan Solomon as the new Director of the Department of Architecture, Interior Architecture, and Designed Objects (AIADO). Solomon, who comes from his position as associate professor and associate dean at the School of Architecture at Syracuse University, assumes the job officially on August 1. In 2010 Solomon, who holds a Bachelor of Arts in Urban Studies from Columbia University and a Master of Architecture and Certificate in Media and Modernity from Princeton University, helped curate Workshopping: An American Model of Architectural Practice at the Venice Architecture Biennial. He is the co-founder of 306090, a nonprofit arts stewardship organization. He previously taught design at the City College of New York, the University at Buffalo, and the University of Hong Kong, where he led the Department of Architecture as Acting Head from 2009 to 2012. He is a licensed architect in the State of Illinois. Solomon recently spoke on a Chicago Architecture Foundation panel discussing Chicago Tribune architecture critic Blair Kamin’s series on Chicago designers in China. He is related to Lou Solomon, who helped found Chicago design firm Solomon Cordwell Buenz (SCB). With the real estate market drifting through a relative recovery, one prominent Chicago developer seems to be saying, "Come back in, the water's fine." The team behind Chicago’s Aqua Tower is gearing up for another high-rise nearby. Chicago-based Magellan Development Group hired Studio Gang Architects for another tower in the 28-acre master-planned neighborhood of Lakeshore East. Gang’s 82-story Aqua Tower, 225 North Columbus Drive, opened in 2009 to international acclaim. 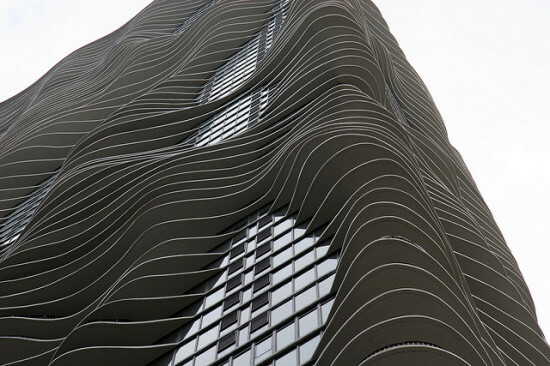 Its organically rippled balconies suggest the movement of wind across water. The undulating balconies are functional, too, providing sun shading and eliminating the need for a tuned mass damper. Design details for the new tower are forthcoming, but the developers said it could work on either of two sites in the Lakeshore East area. Five years after the mixed-use tower opened, Aqua saw its last unit sold February 21. Dennis Rodkin reported the 3,200-square-foot town home at the building's base sold for $1.7 million. Aqua’s 262 condominiums, 474 apartments, nine town homes and 334-room hotel are a landmark for the Lakeshore East neighborhood, which is now home to more than 5,000 residents. Development there has taken off since Millennium Park’s 2004 completion. Magellan’s master-planned community include a Dubai-based private school's first U.S. location, a six-acre park, and towers from the likes of SOM, DeStefano + Partners, Solomon Cordwell Buenz, and Steinberg Architects. 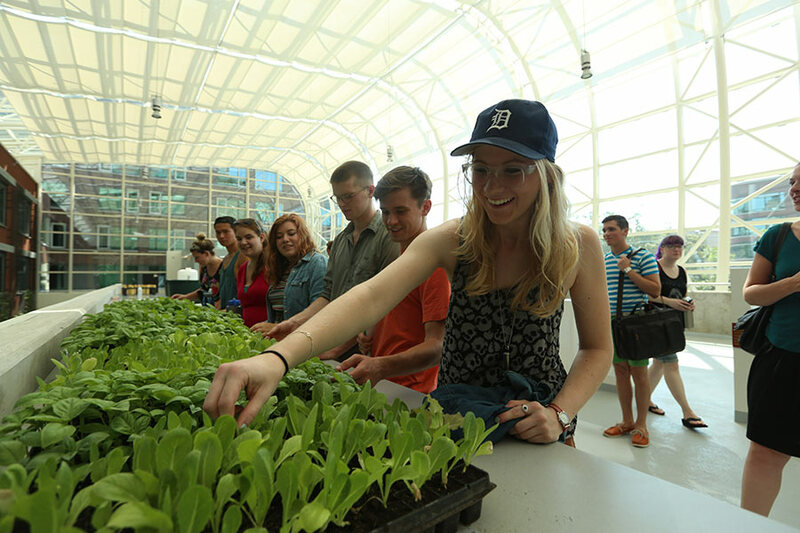 When they open their dorm room windows, Loyola University sophomores living in the college’s new Center for Sustainable Urban Living won’t glimpse another brutalist high-rise; they’ll look out onto the massive greenhouse that contains the building’s atrium, lobby, and agricultural lab. Trusses 62 feet long curve over the space, breaking with the classic symmetrical arc of most farmland greenhouses. Instead, the dynamic shape shrugs wind and rain off to the building’s east, nourishing its natural ventilation and greywater recycling systems. 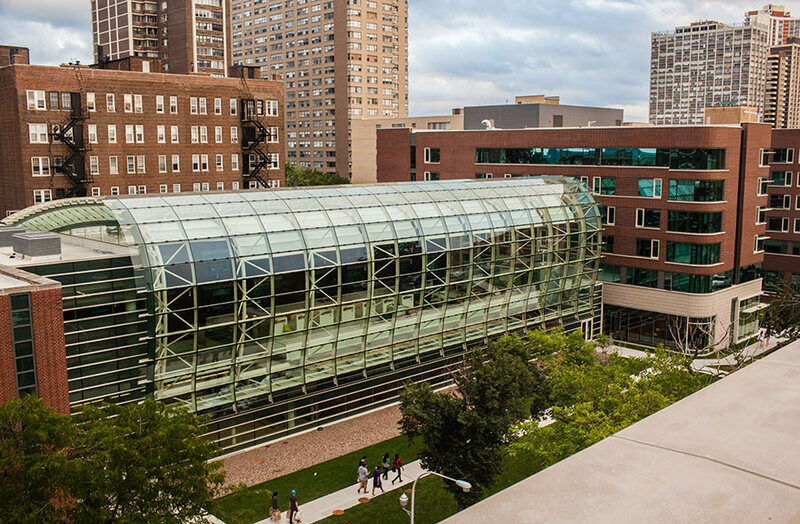 In the midst of a building boom, Chicago’s Loyola University asked SCB to add residence halls, classrooms, labs, and offices to a new chunk of its lakeshore campus in Rogers Park. To sort out the many programs, the architects took inspiration from Thomas Jefferson’s “academical village” at the University of Virginia. The Founding Father organized dormitories and classroom buildings around a central lawn, promoting interaction among an intellectual community. Likewise SCB’s design folds an existing high-rise building on Sheridan Road into a plan that links its 10 stories to more freshman dorms on the site’s south end, with labs, classrooms, and a student lounge populating the buildings’ lower floors. The northern structure is now home to the Institute for Environmental Sustainability. Between the two taller structures is an atrium space that serves as the building’s “lawn” in the design team’s Jefferson analogy. It is a greenhouse and learning lab that will also supply food to the new dorm’s café. 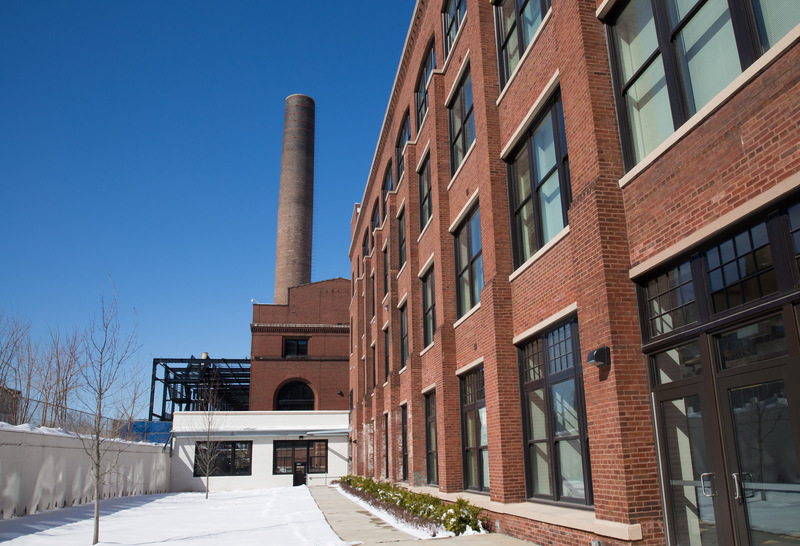 The project boasts the largest geothermal heating and cooling system in the city. About 215,000 square feet spread across two acres, the predominantly low-rise complex is well-suited to geothermal; a higher density development wouldn’t be able to pull off the 15-year payback the system promises Loyola. LCD screens display temperatures in real time above several of the many pipes that send water through the building’s 91 geothermal wells, each 700 feet deep. As students and visitors traverse the lobby, they see the building’s pipework through several glass casings. They also glimpse the base of a green wall meant to cover and shade the sophomore dorms that run along the lobby and greenhouse building’s east side. Thanks to tall ceilings, from which ring-shaped “modern chandeliers” hang, the street-level lounge also offers views of a green wall and an area for fruit trees next to the greenhouse space overhead. New lab rooms outfitted with all-bamboo casings house Loyola’s Solutions to Environmental Problems program, which gathers students from diverse majors and asks them to solve an environmental problem on campus. Within sight of the new classrooms is the product of one of those classes: a small biodiesel refinery of sorts that converts campus fryer waste into enough fuel to offset 10 percent of the gas used by the university’s bus fleet. Homemade biodiesel will also run a boiler to heat the facility for a few days a year when the geothermal system is scaled back to allow underground heat to replenish. Loyola’s biodiesel production is the only university-based program licensed by the federal government to sell its product. Filling only a fraction of its new home in the Institute for Environmental Sustainability’s new Clean Energy Lab, the biodiesel program will seek waste grease from other area universities in an attempt to increase output from 3,000 to 100,000 gallons per year. 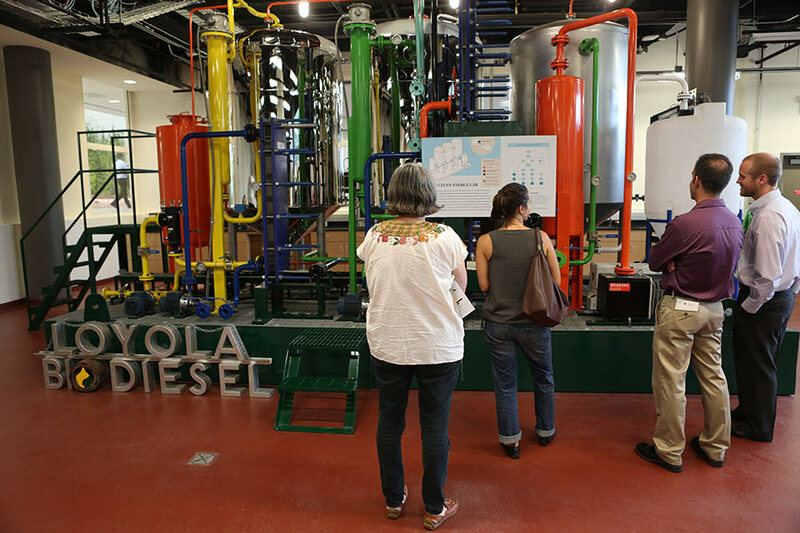 As with the building’s geothermal pipework, SCB invites visitors to inspect the biodiesel program’s guts. Brightly colored pipes and large windows open toward Sheridan Road and onto the Institute for Environmental Sustainability’s atrium. A lattice reaches up past labs and walls colored red, orange, and green for wayfinding. A small vegetable garden will grow at its base, while hop plants climb three stories to the building’s skylight. SCB will measure the building’s performance during its first month of operation. The firm is hoping that the facility’s energy use comes in at more than 70 percent below ASHRAE standards. On October 24th, AN and Enclos present Facades+PERFORMANCE, an architectural symposium in Chicago on the complexity, construction, and design of modern facades. Gathering some of the leading architects, engineers, and innovators within the field, panels and keynotes will address the most pressing issues of facade design today. Among these experts is Pratik Raval of Transsolar who will be leading “Climate Responsive Design,” a discussion of the foundations, challenges, and solutions found within engineering for optimal human comfort and low environmental impact. Raval is a regular studio jury at Colombia University and the University of Pennsylvania, a frequent presenter for various architectural and engineering symposiums, and a guest advisory board member for the New York City College of Technology’s Bachelor’s program in Architectural Technology. He has a diverse background in both tech and design. Using Transsolar project examples, he will provide Facades+PERFORMANCE attendees with insight on optimization and collaborative architectural integration with the built environment. Transsolar is a climate engineering firm dedicated to creation of the highest aesthetic impact with the lowest ecological consequences. Raval has been involved in several important projects with the firm, focusing his skills on designs for optimal energy consumption through creative architectural and engineering design solutions. He recently developed climate concepts for the Center for Sustainable Urban Living at Loyola University in Chicago with architecture firm, Solomon Cordwell Buenz. The student housing complex, set to open this fall, consumes 50 percent less energy through green initiatives that harvest its outdoor environment for the benefit of its indoor climate. Register for the symposium and see the complete Facades+PERFORMANCE schedule.